Is it possible not to love spring? There’s something so uplifting about the rebirth and awakening of the natural world around us. For me, this is particularly the case when I visit the flower market and all of my favorite varieties are back in rotation. When it comes to setting a spring table or even just decorating my home for every day, the heart of this season can be appreciated through spring centerpieces. These lovely florals can range from simple mason jars filled with tulips to an extravagant thematic centerpiece befitting a formal party. 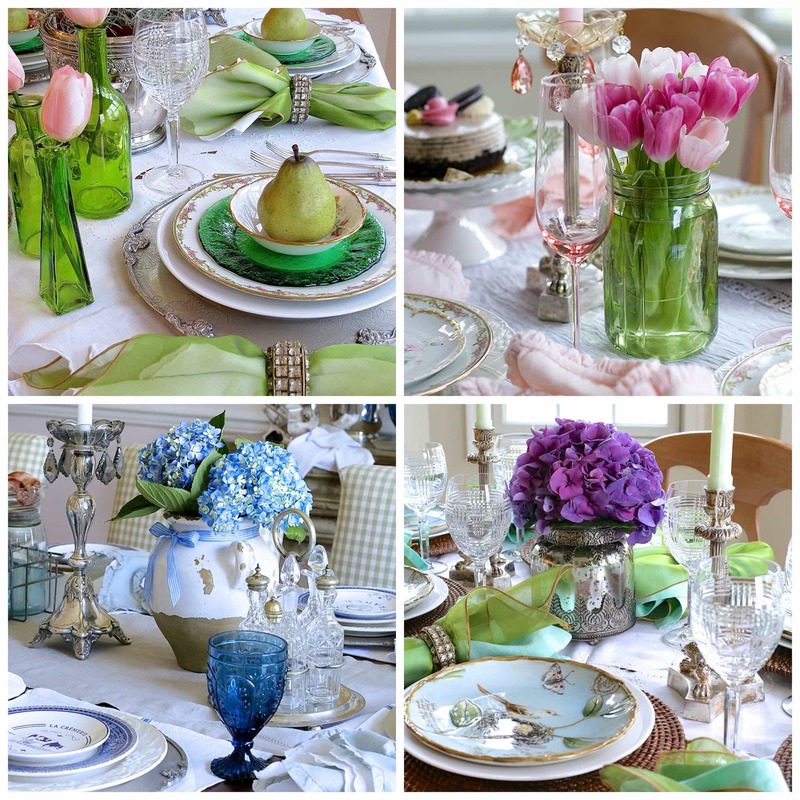 I thought it would be fun to take a look at some of my favorite tables from not that long ago, beginning with this emerald green setting that is perfect for celebrating an elegant St. Patricks’ Day. You can click on the links or photos to see the full posts, with detailed pics and resource info included. 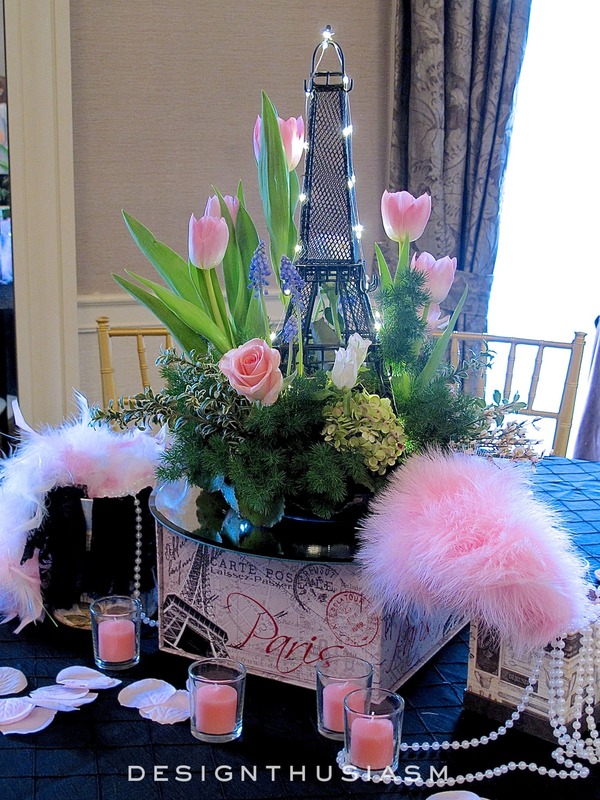 This next table embraces my love of pinks, a staple often found in spring centerpieces. The vibe is a mix of vintage and new, with a few surprises that are not typically meant for the table. 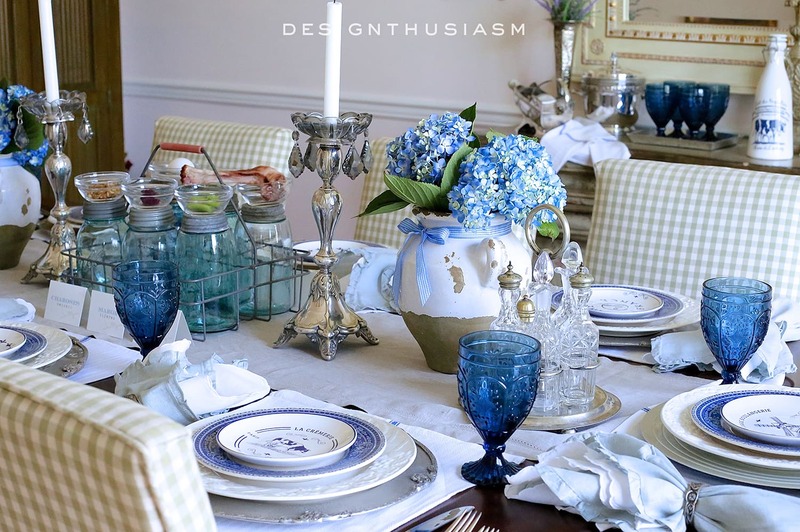 The table below was set for a Passover seder, but it would be equally appropriate for any spring occasion, utilizing French blue and white for a Country French feel. Click the link to see a closer look at my DIY seder plate, ad-libbed using vintage mason jars. This table enjoys the nature motifs that are so popular this time of year. The pop of purple and the mix of varied greens helps give the table a fresh new look, despite having used these plates before. The next two tables were done for corporate events, where elaborate thematic centerpieces decorated the space. 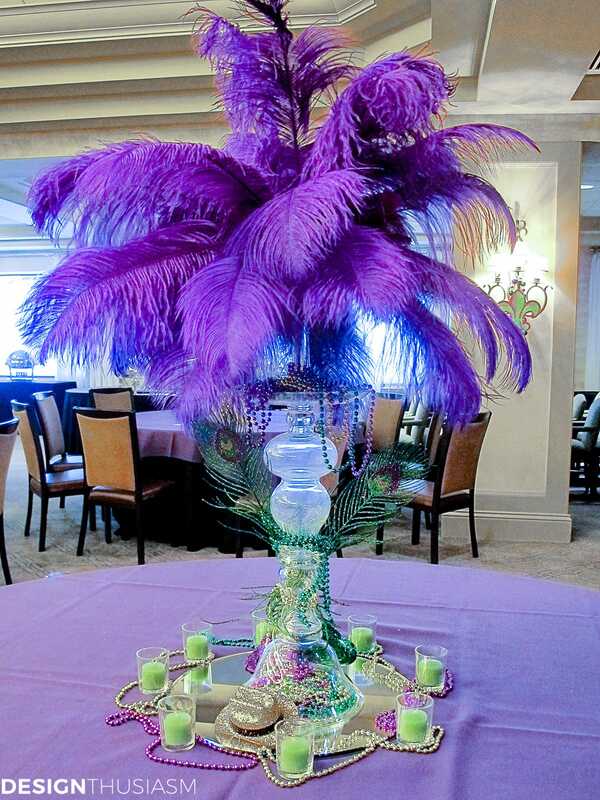 The first was themed ‘April in Paris’, while the last one revolved around a Mardi Gras theme. Spring lends itself to some wonderful concepts and ideas, and the spring centerpieces I love most incorporate fresh flowers among other textures. No wonder I love this happy season! Lory, you always design the most gorgeous table settings! I love all the color and your beautiful accessories. It looks like another warm day in the northeast – bring on spring! Thanks, Shelley! And I am so with you!! It may be raining but at least it’s not snow. Does this mean we’ll get peonies earlier? Love all these tablescapes! I’m a new subscriber & so far I’ve enjoyed all your posts. Look forward to reading & enjoying more of them. Jo–look out, you will never get anything done -You will constantly be reading the posts. Lory is fantastic !!! Lory: All are lovely. I am especially drawn to the pink setting. 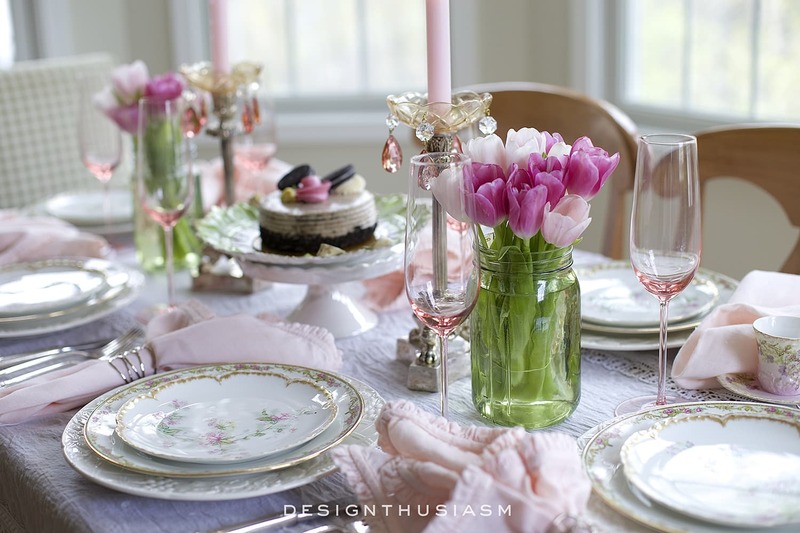 Love the pink tulips and the china is beautiful. 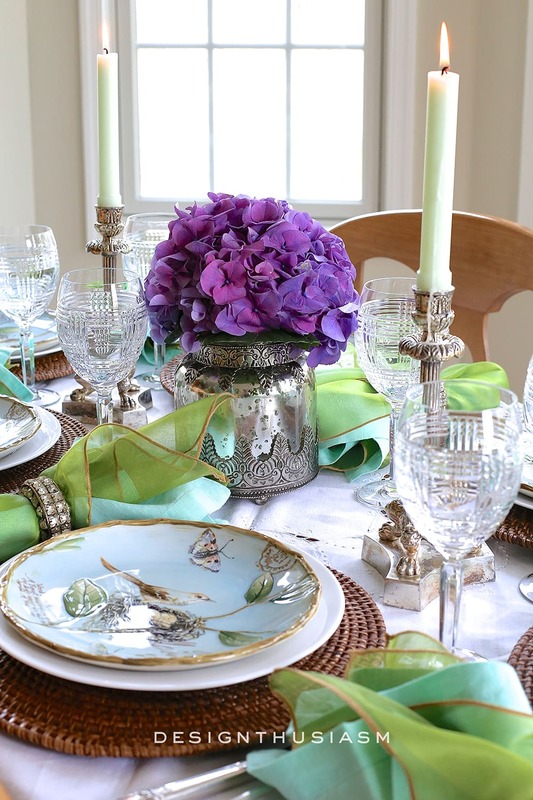 Also, love the green with the purple hydrangea. Wonderful inspiration – thank you! Love all of these Lory! I just photographed a Spring tablescape too. I love all of your tables; they are so inspiring. So many beautiful table settings. I don’t know how you come up with the variety that you do, but I sure love looking at them, and copying some as well. You are great inspiration! Hugs! Just gorgeous! I am so inspired!! As always, I really enjoy viewing your tablescapes. Your talents are inspiring and have encouraged me to try my hand at a spring arrangement that though not elaborate but a simple one, I am enjoying the beauty of the flowers and colors. Thank you. 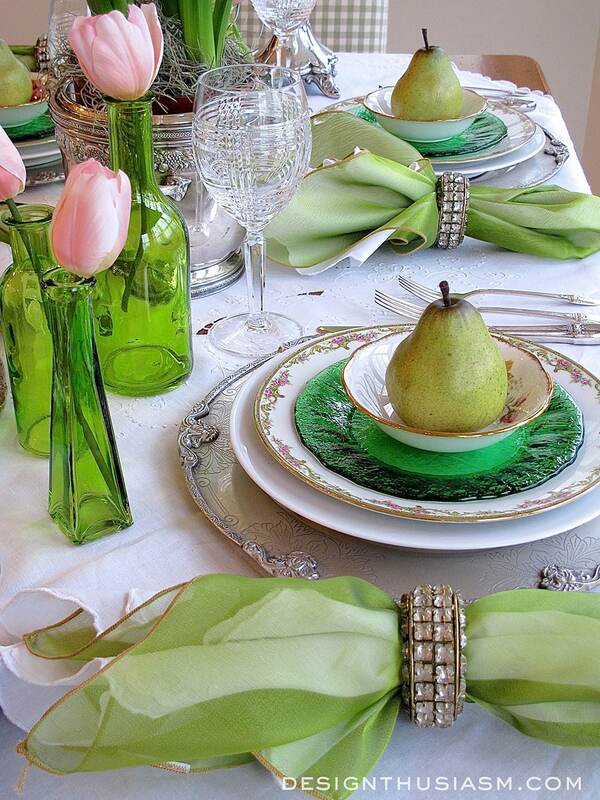 Every Tablescape is perfect, Lory…especially love the emerald green setting!